a litany of worst-case marital woes. on the Spring carpeted earth. and the first wintering frost. collided with my wife’s intermission. she said, lapsing toward lingering silence. just enough for a few more seasons. 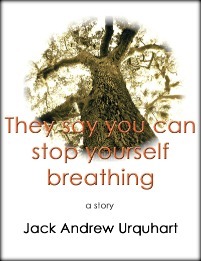 This entry was posted in Uncategorized and tagged Every Man Jack, Jack A. Urquhart, Jack Andrew Urquhart, last words, marriage memories, marriage poetry, Prose poem, Prose Poetry. Bookmark the permalink.